Since the crash, the Silicon Valley has recovered faster than the nation on average. Narrowing the range to our four comparison cities - Los Altos, Mountain View, Palo Alto, and Sunnyvale - we have an above average group even against Santa Clara County (see graph below). Experts at DataQuick, an independent real estate analysis company, report that the median sales price and home sales have fallen in the Bay Area from a year ago. The same is true in our example cities. But in a post-crash economy the most important factor real estate professionals, buyers, and sellers are looking for is a stable market. Prices in our four cities have remained stable, yet deprecated, for the past two years. What will really excite the housing market is a return of high-cost homes and increased buyer confidence found in areas such as gains in employment and relaxed credit standards from banks. While some have seen this as an opportunity to find a house for less, most of the market is collectively holding its breath. 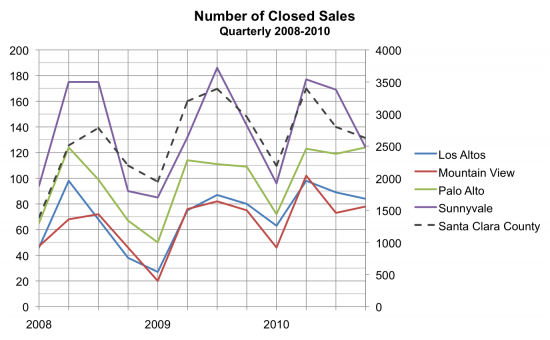 So with anticipation of what 2011 brings, lets review how 2010 was for our four real estate cities. We've also talked about the median selling price over the years here and here, and we're getting further away from the dump in housing prices that occurred late 2008. Like we mentioned in the opening, what people are looking for is stabilization, but also, at what price will that occur. This quarter, Palo Alto nearly dropped to its lowest price since the bust, unusual for a strong market, but is expected when top-tier homes are not being put up for sale until the market improves. There is obvious demand in this city as it has the lowest average days on market of our comparison cities (see third graph). Currently, Palo Alto is around 2005-2006 levels, which is about 4% lower than the fourth quarter in 2006 compared to the same quarter in 2010. But where Palo Alto struggled in the past two quarters, Los Altos has risen two straight quarters. Although the news is tempered by its current fourth quarter median sales price, which is about equivalent to its first quarter in 2006. At a price point $500,000 or so lower are Mountain View and Sunnyvale. Continuing to be the most stable city of the group, Mountain View has reliably hovered at a median price of $900,000 for single-family homes -- equal to the first half of 2006. Sunnyvale reflects the current movement of Santa Clara County, and moved back to levels found near the end of 2004. The sales price to listing price ratio gauges buyer and seller expectations. (Consider that a 1% difference here on a million dollar home is equal to $10,000.) The first thing that jumps out is Palo Alto is the only city in our comparison where homes are selling higher than their listing price, a ratio above 100%. With Palo Alto and Los Altos trends reversed from our last graph, Los Altos increased its median price but the majority of the home sales in the city have made pricing adjustments to fit the mood of the conservative buyer. Mountain View, which also saw a bump in the median price, faced a dramatic drop of about two percent to 98%, down from 100%. This could be a correlation with more aggressive sellers entering these markets, but they are not getting the bites they saw in 2008. Sunnyvale remained similar to the previous quarter, nearing a balanced market between buyer and seller. Interestingly, Santa Clara County has not realized a ratio above 100% for some time, unlike our four comparison cities. Going back to our 2000 to 2010 report, the county broke 100% in the beginning of 2004, peaked above 104% for single-family homes in spring 2005 and fell under again mid-2006. As a comparison, the average ratio for our four cities remained above 100% from 2004 until late 2008. Average days on market is another good indicator of market health. So much so that sometimes buyers and sellers put unreasonable weight into days on market of a house listing. But in markets where emotions can play a large role in a purchase, it is not unexpected and something to be dealt with. This graph mostly looks like a mess of weaving colored lines, with no consideration to housing prices. Signs of a bubble popping through a climbing average days on market were felt in Santa Clara County as a whole late 2005, whereas most of our four comparison cities kept an average days on market below 40 until 2009. The days on market of the county and our cities are more closely aligned now that the market has cooled, as we can see they are following a similar trend since late 2009. In the number of closed sales graph we were able to put our four comparison cities on the left vertical axis and also include Santa Clara County homes sales using the right vertical axis. While county sales are not comparable in number to city sales, displaying both can help compare overall trends to the individual cities. Traditionally, home sales dip during winter and peak during spring and summer. 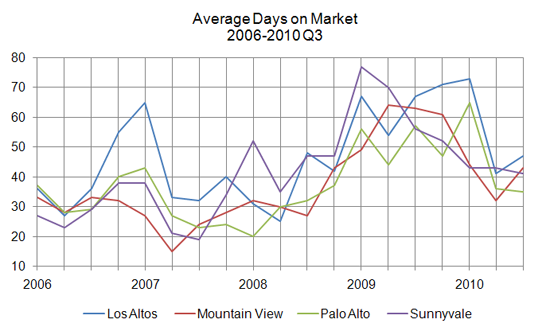 But looking at 2010, Palo Alto pushed up, Los Altos dipped, Mountain went up, and Sunnyvale followed the winter plunge. Buyers are out there combing for good deals, especially in valued markets such as Palo Alto. Though previous years have shown that the biggest dip happens during the first quarter of year, so we'll have to wait and see if these cities continue to break the trend. One positive emerging trend occurring for all our four comparison cities and county alike, is a steady increase of sales, most clearly seen when you compare first quarters. The winter months are rolling through the fourth quarter of 2010, and home sales have sunk along with the median sales price and average days on market. This is no surprise and remains a truth that there are seasons in real estate, and we can expect it to stiffen as we enter the first quarter of 2011. Comparing the fourth quarter of 2010 to the same period in 2008 (closed sales, 90; average days on market, 47; median sales price, $656,500) and in 2009 (closed sales, 141; average days on market, 52; median sales price, $760,000), Sunnyvale is wavering but not falling into a double dip market that bearish experts are predicting. - Sunnyvale, Mountain View, and Palo Alto have improved their median sales price - Average days on market dropped 30% or more in all four cities - Palo Alto bumped above 100% in the sales price to listing price ratio for the first time since 2008 - Number of closed sales are up in Palo Alto and Los Altos, and down in Mountain View and Sunnyvale; Concurrently, the same is true for total sales volume. So read on to get more information about the number of homes sold, median sales price, average days on market, and selling price to listing price ratio. All of our data comes from MLS listings inc. measuring single-family homes. The homes sold graph clearly shows the natural market cycle that dips in the fall and peaks in the spring and summer. What we are looking for in the following graphs is how each individual city performed before the housing bubble crash (pre-2007), during, and in the recovery period (after 2009). 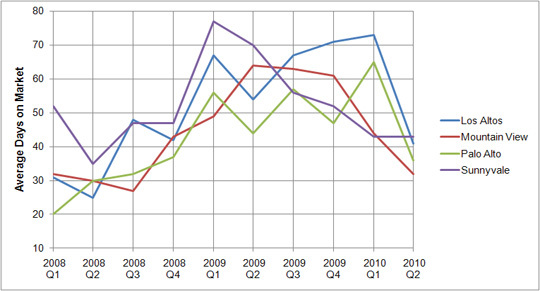 All cities began to slide in 2007 and dropped to their lowest levels at the end of 2008. This also meant more homes on the market and an increased inventory, including foreclosed and short-sale properties. If we compare the first quarter of 2009 to the first in 2010, all four cities jumped in number of homes sold: Los Altos (+133%), Mountain View (+130%), Palo Alto (+44%), and Sunnyvale (+13%). In median sales price we can see the obvious spike in home prices that occurred because of the housing bubble. Mountain View peaked mid-2008, about a year before the other three cities did. Mountain View also suffered less of a downturn when the bubble popped. You can see the other three cities sliding at the end of 2008, while Mountain View prices increased. Today, we notice that levels have smoothed out since 2009 and have worked their way towards 2006 levels, experiencing a small drop, with Los Altos the exception, this quarter. Another thing to consider in the steep drop of home prices at the beginning of 2009 was in part of expensive homes coming off the market, such as in Los Altos, and low-valued foreclosures and short-sales coming onto the market, bring down the overall median sales price. Like mentioned earlier, Sunnyvale (+3.6%), Mountain View (+3.4%), and Palo Alto (+6.7%) increased their median sales price compared to last year, but realized a deprecation from last quarter; the reverse is true for Los Altos. Average days on market is a good indicator of market health -- closer to 30 days means properties are coming onto the market at a good price and buyers are interested; above 60 days means properties are priced poorly or buyers are nervous about the market, or both. Los Altos peaked in early 2007, quickly dropped, and followed the similar trend of the three other cities, but taking, until 2010, the longest to recover. Sunnyvale is interesting because it has the largest population and is the city with the lowest median sales price. It is more likely that Sunnyvale had more distressed properties that pushed up its average days on market higher than the other cities from 2007 to 2009. But Sunnyvale also dropped the soonest once buyers became confident in the market again just after 2009. Palo Alto, considered one of the strongest housing markets in the state, had the lowest days on market this quarter of our comparison cities. In the next graph we can see that it is also the only market that has turned into a seller’s market. In the sales price to listing price graph we explore what makes a buyer’s market (below 100%) and what makes a seller’s market (above 100%). As the housing bubble grew, buyers were willing to pay above listing prices to get the home they wanted. 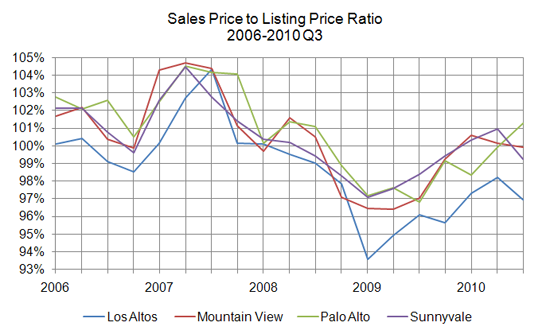 From our previous median sales price graph, home prices peaked in the third quarter of 2008, but then quickly fell in 2009 -- Los Altos being a major example of peaking in median sales price then falling the most in both the median sales price and the listing price to sales price ratio. Buyers weren’t taking anything for a period and sellers weren’t ready to adjust their home prices. It has taken until 2010 and later for the market to really stabilize here in the valley. The ratios for Mountain View and Sunnyvale are hovering around 100%; Los Altos is still struggling at 97%, while Palo Alto has turned to a seller’s market at 101.26%. Closing It’s always easy to look back and be able to see that the housing market was peaking, but at the time it is very difficult for an individual to judge if the market would sustain its levels or pop like it did. What we are realizing today is a much more conservative market that is looking for a sustained growth rather than the feeding frenzy that happened. One advantage of being in the Silicon Valley is that although we took a hit, we returned to levels that existed only four years ago and are seeing signs of stabilization or even growth (Palo Alto really standing out). We’ll be able to tell in the next couple quarters if that holds true (the upcoming winter quarter is slower for real estate), and we’ll try to do a larger comparison that shows the Silicon Valley compared to other parts of the nation, and lastly, how neighborhoods within cities are doing. Sunnyvale has gone through another quarter without any major hiccups, showing improvements from a year ago. The median sales price has been steadily increasing from its recovery in early 2009, and is equivalent to 2006 prices. Average days on market have also dropped to 41 days, down from 77 days in the first quarter of 2009, though it has yet to reach the unusually low 23 days that occurred in the second quarter of 2006. Lastly, the sales price to listing price ratio is hovering around 100%, meaning sellers are pricing homes at prices buyers expect to pay -- neither a strong seller's market as in 2007, nor a buyer's market as in 2009. In the second quarter of this year (April to June) we can really see which areas of the housing market have bounced back from the crisis and which areas are still struggling. To visualize those details, and to complement our second quarter 2010 analyses of Los Altos, Mountain View, Palo Alto, and Sunnyvale, we have created some city comparison graphs. We’ll cover total sales volume, sale price to listing price ratio, days on market, median selling price, and number of homes sold, using data on single-family homes off of MLS listings Inc.
Total sales volume clearly shows that over the past two-plus years the housing market dropped after peaking in 2008, then slowly bounded up and down, successively higher each quarter. The second quarter of this year really reflects a trend towards returned growth in the housing market of our local cities. One additional interest to point out is that although most of the cities have not yet reached 2008 sales volumes, Mountain View has surpassed it. The sales price to list price ratio is one way to show buyer and seller perceptions: above 100% is a seller’s market, and buyers are paying above the listing price to win a house; below 100% is a buyer’s market, and sellers are having to reduce their listing price in order to sell a house. The closer a city is to 100% the more the market is balanced. On a house that is listed for $1 million, a 1% change would amount to $10,000. In both quarters this year, Mountain View and Sunnyvale have both been above 100%, a result of high demand for entry-level homes. Palo Alto and Los Altos, the more desirable and expensive of the cities, are still under 100% (Los Altos is at 98.21%, recovering from a glaring low of 93.56% in the beginning of 2009). The Average days on market is a good indicator of buyer demand and the overall health of the housing market. From the graph, we can see all four cities returning nearly to 2008 levels this quarter, with Palo Alto and Los Altos realizing the greatest second quarter drops. This is another signal that the market is shifting to a seller’s market, making it more difficult, once again, for buyers to get find a good deal. The median selling price can be used in conjunction to the earlier ratio graph. 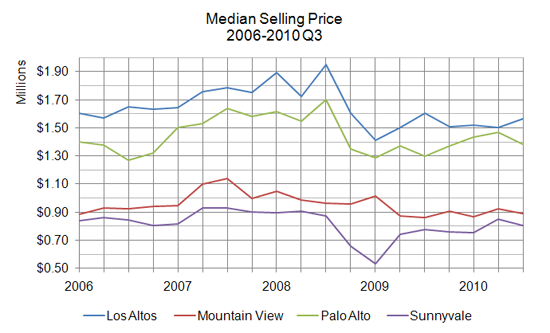 Palo Alto, Mountain View, and Sunnyvale, which are all near or above a 100% ratio, have median prices that are rising. Los Altos, however, is still far from a 100% ratio and its median sales price remains stagnate. Currently all four cities are off second quarter results in 2008 by more than 5% -- Los Altos is even more at nearly 13% under -- so buyers can still expect to save money due to depreciated home values. The number of homes sold for each city has either nearly returned to 2008 levels, or surpassed it in the case of Mountain View, which is 50% higher this quarter than the same period in 2008. Part of the reasoning is traditionally more homes go on sale and are bought during the summer months. But this also a result of more sellers willing to sell their homes in a stronger market and a release of pent-up buyer demand. Sunnyvale is one of two cities in our comparison that has turned into a seller’s market the past two quarters. Perhaps it is the urgency of the buyers to find an entry-level house (Sunnyvale has the lowest median sales price of our four comparison cities) before the effects of the housing crisis completely recede that is driving demand. The median sales price jumped 12.7% compared to last quarter, to $851,000. Average days on market remained the same as last quarter, while number of homes sold was just higher than the same period in 2008, at 177. Sales price to list price ratio is 100.95%, meaning most sellers are encountering multiple offers over listing price. Although the median sales price and total sales volume are still lagging compared to 2008 numbers, Sunnyvale is reporting strong numbers in other areas this quarter, showing that the city has pushed out of its slump. In order to help visualize the previous posts on the 2010 quarterly updates for Palo Alto, Los Altos, Mountain View and Sunnyvale, the graphs below show each city in comparison of overall home sales, median selling price and average days on market. 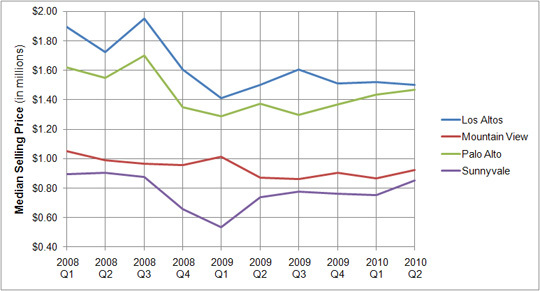 The graphs cover quarterly results from 2008 to 2010 for single-family homes using data from MLS listings Inc. It is hard to see how the cities responded to the crisis within this time frame since most home sales drop off during the winter months and spike in summer. But it is clear that home sales sagged in the first quarter of 2009, were slow to return initially, and then eventually returned to similar or stronger numbers by the end of 2009, which have continued through 2010. All four cities home prices started to slip at the end of 2008, with the exception of Mountain View, which dropped a couple quarters later. Prices rebounded mid-2009, after cities like Sunnyvale had bottomed out in the beginning of 2009, and have begun to stabilize at a depreciated value. Los Altos, which has the most expensive houses of the four cities*, realized a 20 percent drop from the beginning of 2008 to 2010; Mountain View dropped 17 percent, Palo Alto dropped 11 percent, and Sunnyvale dropped 15 percent. 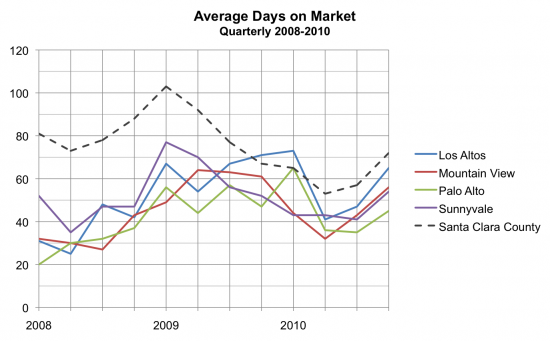 Building up to the crisis, average days on market increased for all four cities until the beginning of 2009. Interestingly, Los Altos and Palo Alto numbers are still increasing today, while Sunnyvale and Mountain numbers are dropping. This may be a result of higher priced homes in Los Altos and Palo Alto that tend to stay on the market longer, especially in a recession, in contrast to the strong demand for the greater supply of low priced entry-level homes in Mountain View and Sunnyvale. Current Sunnyvale real estate market update for 2010. Looks at median sales price, days on market, and factors that have helped Sunnyvale recover from the real estate crisis.